Leading Welsh artist Clive Hicks-Jenkins was commissioned by the trustees to make this work for the Methodist Collection of Modern Art. The two benefactors funding the commission wanted to demonstrate the readiness of Jesus to challenge accepted beliefs and that he aimed to emphasize the spirit of the law rather than the letter. Hicks-Jenkins’ approach to this subject was first to look at historical precedent. He found very few examples before the 19th century, when he felt the encounter was treated in an overly sentimental way. The woman appears contrite, ennobled and, as a result, easy to forgive. Hicks-Jenkins believed she should be more streetwise, older, flaunting, so that she would be more difficult to forgive. His early drawings trace the development of these ideas. A sense of place is very important to Hicks-Jenkins. In 2010 he spent time in Montclar, a small village near Barcelona in Catalonia. Initially it appeared charming and picturesque, but conversations with villagers revealed tensions beneath the surface, as unresolved and unforgiven events from seventy years earlier in the Spanish Civil War still exerted their influence. ‘It was the drawing of Montclarthat gave me the composition that would knit everything together,’ he says. In the 19th century, this story might have seemed remote and hard to imagine. Not today. We have seen people stoned to death in real time on our TV screens. People still rush to judgement. It’s still the case that the powerful and rich (and invariably male) get off, and the weak and the poor (and usually female) are punished. The woman in this painting is not an innocent. She’s not young. She’s been around a bit. But she is being humiliated, treated like an animal. Christ comes alongside her. His posture, as he writes in the dust, echoes hers. And the accusers are in the foreground, the stones behind their backs. We, who view the picture, are ranged with them. We are being required to think about our own reaction to the stark scene. 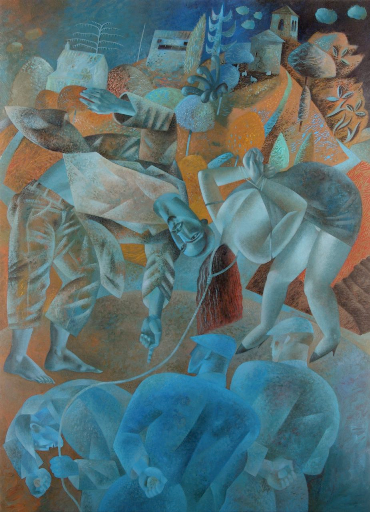 Clive Hicks-Jenkins: Christ Writes in the Dust – The Woman Taken in Adultery, 2011, acrylic on panel. 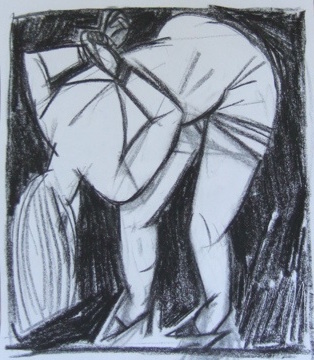 Clive Hicks-Jenkins: Christ Writes in the Dust – The Woman Taken in Adultery, 2011, preliminary drawing and grisaille. All three images are copyright of the artist. The Methodist Collection of Modern Art is the owner of the main work, seewww.methodist.org.uk/static/artcollection/index.htm. Clive Hicks-Jenkins was born in Newport, in the south of Wales, in 1951. His early career included work as a dancer, choreographer, puppeteer, stage designer and director, becoming Associate Director of the Cardiff New Theatre. Since the 1990s he has concentrated on his work as a visual artist. Clive Hicks-Jenkins written by Simon Callow et al. is a substantial monograph about his work. It was published in 2011 with Lund Humphries - Ashgate. Clive Hicks-Jenkins is an Honorary Fellow of Aberystwyth University School of Art and a member of the Royal Cambrian Academy of Art. He is a member of The Welsh Group and 56 Group Wales. He has lived in London, Newport and Cardiff and currently lives near Aberystwyth, Ceredigion. See also http://www.hicks-jenkins.com and https://clivehicksjenkins.wordpress.com. Meryl Doney is a freelance fine art curator, specializing in presenting exhibitions in cathedrals, churches, festivals and other challenging spaces. She has curated over 40 exhibitions and performance pieces, including Moon Mirror by Rebecca Horne in St Paul’s Cathedral and Presence: Images of Christ for the Third Millennium, a series of thirteen different exhibitions involving 50 contemporary artists. Between 2006 and 2011 she was Director of Wallspace, a 'spiritual home for visual art' in All Hallows on the Wall church in the City of London. She serves on the Art Advisory Group for St Paul’s Cathedral, London and is a trustee of the Methodist Collection of Modern Art.